Richard Foss has been writing about food and drink professionally since 1986, when he started reviewing restaurants for the Los Angeles Reader newspaper. Since then he has written for over twenty different publications, including contributing articles to the Encyclopedia of World Food Cultures (2011) and the Oxford Companion to Sweets (2015). He has taught "500 Years of American Food," “American Fermented,” and "What Shakespeare Left Out" at Osher Institute/UCLA Extension. He is also on the board of the Culinary Historians of Southern California and is the California Curator for the SoFAB Institute and Museum of the American Cocktail. 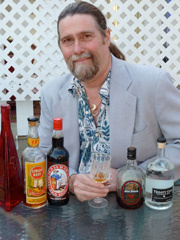 His book on the history of rum was released by Reaktion Books in April of 2012. He is the author of Rum: A Global History (2011) and Food in the Air and Space; the Surprising History of Food and Drink in the Skies (2014)."